A few months back I was looking at options to expand the range of the RTL-SDR upwards. I needed a somewhat stable and tunable UHF/SHF signal source to use as a LO to mix with. 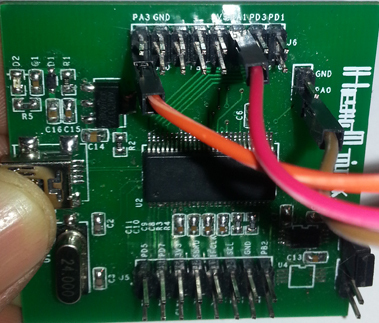 A redditor suggested using the ADF4351 development board as a ready to go signal generator. The ADF4351 (PDF), an Analog Devices wideband synthesizer with integrated VCO, can output an RF signal from 35MHz to roughly 4.4GHz. Precisely what I was looking for except the price was a little prohibitive in the development board format from AD ($250+) for my purposes. A few weeks later it arrived in the mail. I was busy so the box went on the shelf and I forgot about it for a month or so. When I got around to opening it up there are two boards and some wires to connect it all together. Hmm, no instructions on wiring it up. OK, it must be obvious. Right? RIGHT? WRONG! I searched around a little (a whole friggin lot), read the datasheets on the adf4351, the cypress chip, etc. You might think "oh look, sclk and sda. That must be most of it!" wrong. Anyway, on to the reason you are probably here. Something important you need to be aware of. The Cypress USB board you received is probably NOT the one in the image on the eBay listing. In all likelihood it is a counterfeit. But even if it is, and I'm pretty sure mine is, it SHOULD work for these purposes. Also, the actual GPIO(or whatever you want to call them) pin count is different too. My board has two banks of 16 pins, where the one shown in the ebay ad has a few more on the left hand bank (regulator side). For some reason it took me too long to figure this out. I even went so far as to replace the adf4351 chip and the voltage regulator, thinking it was a bad or counterfit chip or a power supply issue (frequency won't lock if the PS is not stable). I feel like a real dummy but I'd wager I'm not the only dummy who tried to get this done. As far as I know this is the only place you'll find this pinout listed online, the Chinese sellers were unresponsive to any inquiries and the model from AD is integrated onto one board. With some of the minicircuit mixers I have on hand (or maybe even straight capacitive coupling) I should be able to RX on up to 6.1Ghz with the RT820T2 and around 6.6GHz with an e4000 tuner. 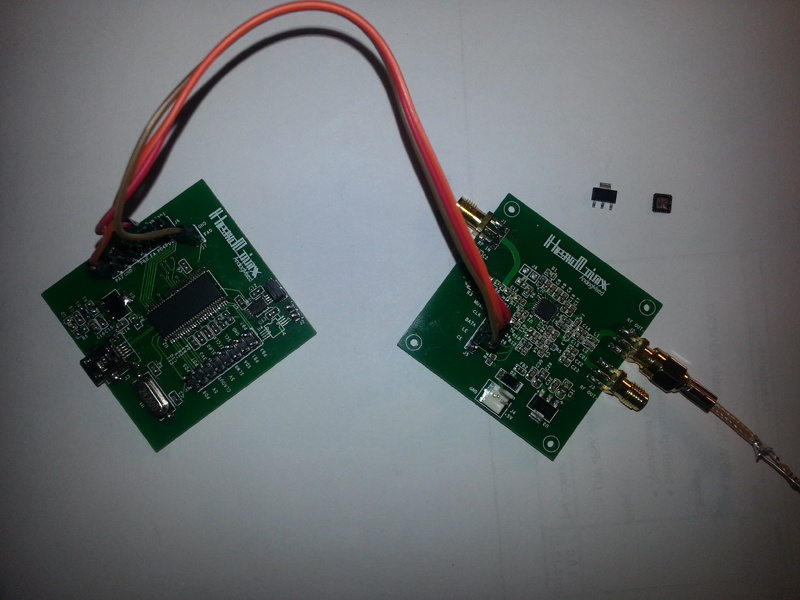 PLUS I also ordered some Hittite HMC189MS8 frequency doublers (2-4Ghz In/4-8GHz Out) and Hittite 4.5-9GHz Mixers HMC219MS8. Both orders came with PCB boards from here in the States and cost around $17 each order. So theoretically I could get up near 10GHz ham band and everywhere inbetween. I'll start playing soon and report back. Probably need to start making some filters, huh? Also, you can download the updated AD4351 control software from AD by clicking here. If you're interested in receiving RF above your SDR or radio's capabilities stay tuned as I'll post some about using this signal source and also about using the DIRT CHEAP modified SUP-2400 satellite downconverter/upconverter with the RTLSDR soon. I'm also going to work on using the Arduino and the AD4351 + rotary encoder as a VFO/Sig Gen just for kicks. 73s, Hope you found this helpful. 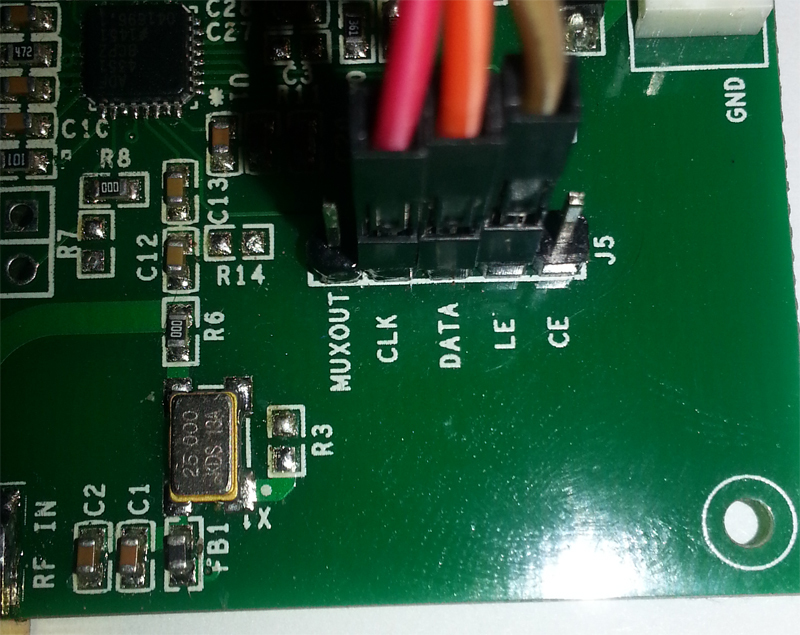 8 Comments on "Wiring the Chinese ADF4351 35MHz – 4.4GHz Sig Gen and Cypress USB Dev Boards"
Wow man you are super fired on SDRS, keep it going. I am super interested to know where are you know with this project? Thank you for your description, it has meant that I have come a big step forward , my second problem was the software from cypress. Now that I ‘ve wired it correctly it doesnt blink . On other pages where people have hooked it up it looks like they use 5v from ez Cy table. Do you know which pin to use for volt ? ( Google translate swedish ) . And I’ll email you my modified version after bit. Want to clean it up some before posting it on the blog. I have interested by this 2 board modified, when can i purchase it and where, please. Still have the modified 2400s for sale ?